Start with a base of simple syrup then add frozen strawberries and lemon extract for a refreshing frozen fruit pop to cool you off this summer. Pour syrup into blender container. Add frozen strawberries and lemon extract; cover. Blend on high speed until smooth. 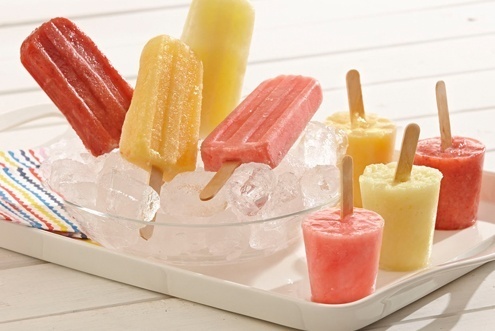 Pour into popsicle molds. If using paper cups instead of popsicle molds, cover each cup in foil. Insert a wooden pop sticks through foil into each cup. Freeze as directed. Pureed fruit mixture may also be frozen in ice cube trays. Add ice cubes to sparkling water, lemonade or iced tea for a fun fruity beverage.